I don’t know what is happening to me. Lately, I’ve had a strong desire to explore baking and cooking, two things that have never previously interested me in the least. I think this recent change has to do with how happy I am now in general and with Pete, but perhaps I’m just at a nesting point of my life. Before this, I never really had a desire to spend time in the kitchen because I was often stressed and would eat entire meals consisting of Cheez-Its, Oreos and pickles (ok, I still do that sometimes, I’ll admit). Besides, that’s what take-out was for. Now that I’m a chipper little thing, I want to prance around in an apron and bake (I don’t have an apron, so I’ll just wipe my hands on my pants in the meantime…don’t judge me). I don’t even really like cheesecake, but this weekend I wanted nothing more than to try to bake a cake for the first time ever. Yeah, you read that right, I’ve never baked a cake. Apart from cutting refrigerated Pillsbury cookie dough, my baking experiences are pretty much non-existent. I am a spazz at operating a spatula and handheld mixer and can barely figure out how to grease a pan. 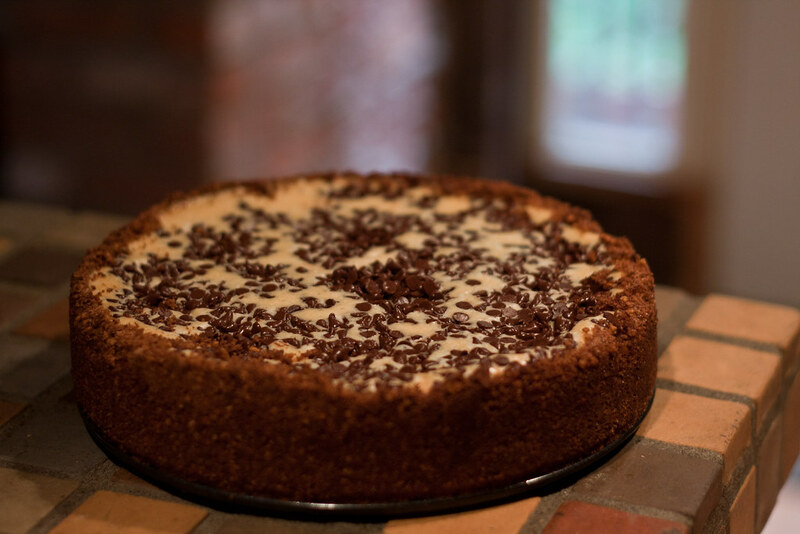 Needless to say, I think my first attempt at baking a chocolate chip cheesecake with homemade graham cracker crust was a success, considering it came out in one piece. The boy said it was delicious and ate his slice in under a minute, so I suppose that counts for something. Preheat oven to 300 degrees F (150 degrees C). Mix graham cracker crumbs, sugar, butter and cocoa. Press onto bottom and up the sides of a 9 inch springform pan. Set crust aside. Bake at 300 degrees F (150 degrees C) for 1 hour. Turn off oven (do not open oven door) and leave the cake in the oven to cool in the oven for another hour. Remove from oven and cool completely. Refrigerate before removing sides of pan. Keep cake refrigerated until time to serve. Do you have a favorite cake or pie recipe that you’d like to pass along? Was your cheesecake as good as dad’s pie? I wipe my hands on my pants too. I need an apron. We ARE SO impressed with your cheesecake. Will you be making one for our upcoming visit? Sure hope so. Dad still wants to teach you how to make his famous pie crust. Guess you can choose your fav – apple, peach, blueberry??? I’ve baked cakes, and Pillsbury chocolate chip cookies of course, BUT NEVER EVER even tempted to try baking a cheesecake. Way too difficult sounding for me. You are very daring and it looks so professionally done. You go girl!!! UHM… holy crap! That looks SO good! 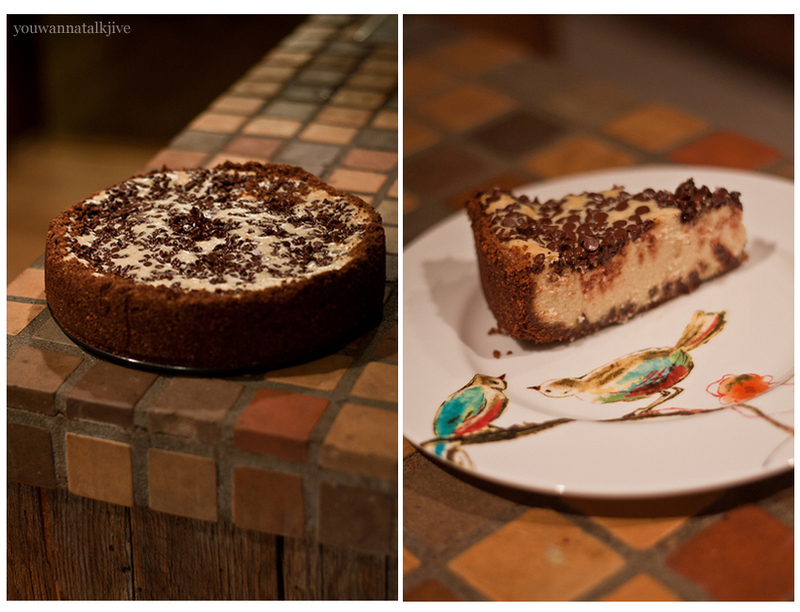 I’ve been wanting to try a cheesecake recipe for a while, this just might be it! !